Filed under art on July 03, 2015. Today I present a pen review that quite probably no one saw coming. You can’t purchase this pen at JetPens. You won’t find it at your local discount store and you won’t even find it at Pen Chalet. Nope, for this one, you need stop by the home of Swedish design; IKEA. On a recent trip to IKEA–West Chester, and after engorging myself on a Swedish meatball lunch, I browsed the home office area and noticed stationary products. My eye was then drawn to the view shown below. “What’s this?” I thought to myself. “Are those actual IKEA brand pens?” And could my eyes deceive me? These are actual gel pens? I expected a ball point or marker, but not a gel pen. 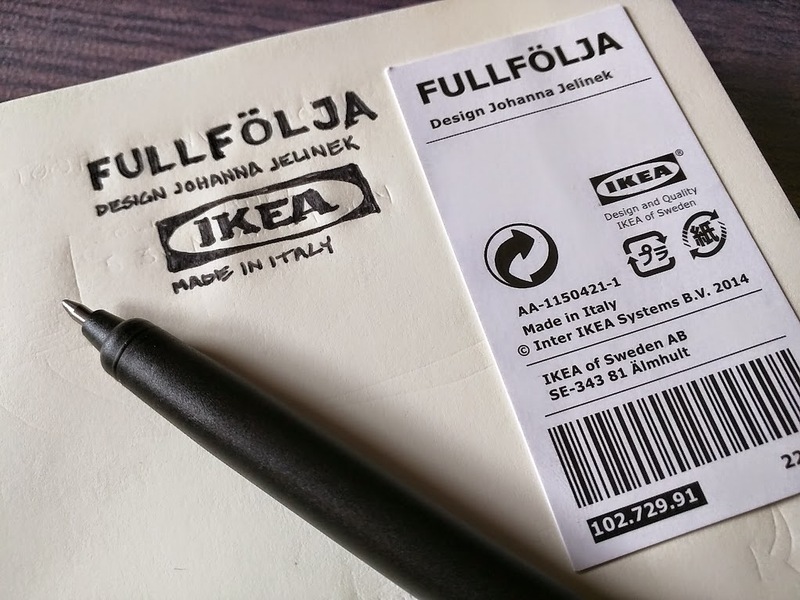 In true IKEA fashion, a Swedish name, FULLFÖLJA, is given to the pen and associated stationary products. Google Translate tells me this means COMPLETE. 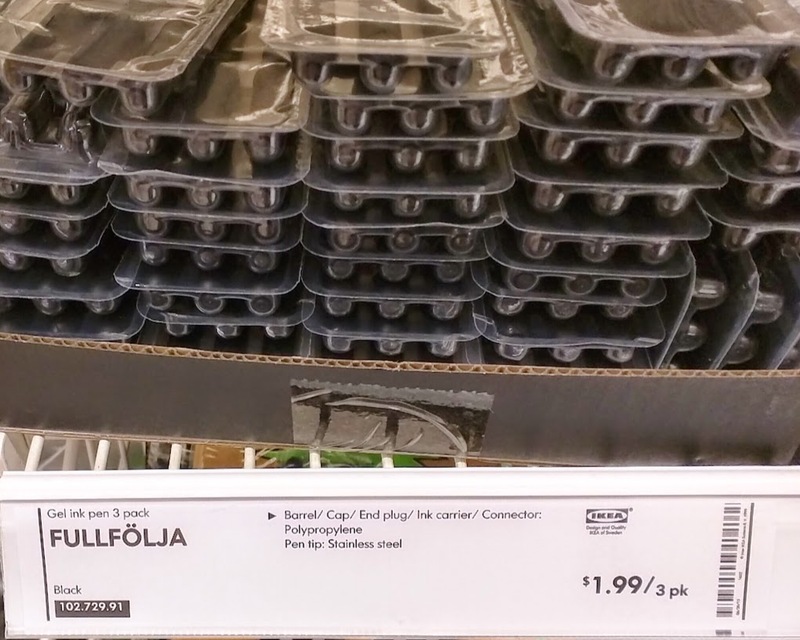 I grabbed a three pack and then noticed the low, low IKEA price of only $1.99. 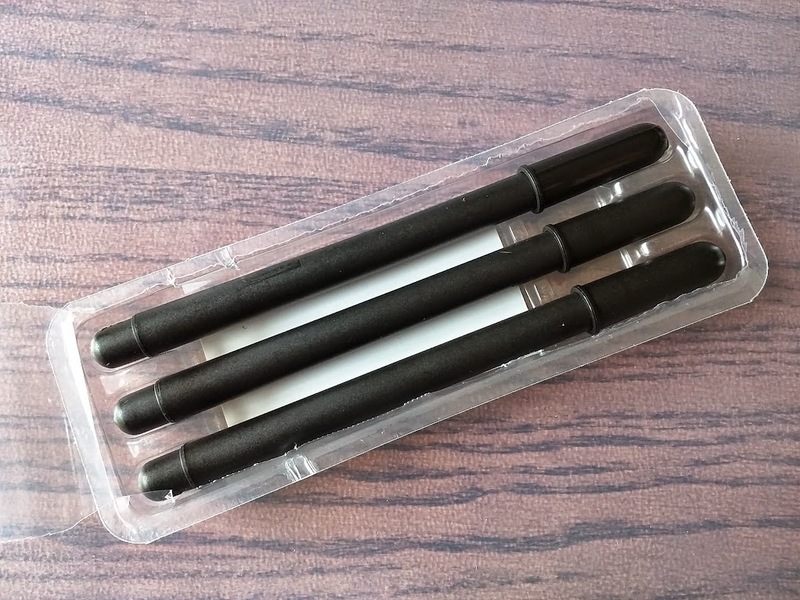 The pens are “hermetically sealed” in a three pack and I was unable try one in the store. Their low cost didn’t make this a hard purchase. I had to try them. In the yellow bag they went along with a similarly branded notebook. At home, I took them out of the bag and placed them on my desk. The next day it was time to run them through a review. Let’s dive in and take a visual look at the pens. Opening the package is a struggle. There is no lip on the cellophane cover to peel. I searched around the package and did not find a way to open by hand. I finally resorted to my trusty box cutter. With the package open, I half expected to find assembly instructions, an Allen wrench and some extra parts. None included. Just the three pens and the label. The package is basic and inexpensive. Perfect for flat pack shipment (a major IKEA design principle) although I couldn’t help but wonder whether a basic box would be better than this custom molded package. IKEA is proud of their designers and this particular pen designer is Johanna Jelinek. IKEA also prides themselves on the location of manufacture. I hoped for a Japanese origin. What I found was a pen with manufacturing roots in Italy. I do not own a pen manufactured in Italy, so this was my first “Italian” pen. The pen is not a marvel of industrial design but it is efficient and appropriate for the mass manufacturing IKEA requires to fill stores worldwide. Still, Johanna has designed a pen that is attractive. There are design features I appreciate in this roughly 5.5” length pen. First, the cap solidly snaps over the stainless steel pen tip to create an air tight pocket. Posting is solid and you will not lose the cap. While the entire pen has a matte finish, a shiny stripe on the cap reminds us that this pen does not include a clip. Lower on the barrel is the familiar IKEA logo. At the bottom end of the barrel is a “G•4” mark. I’m unsure what this references. 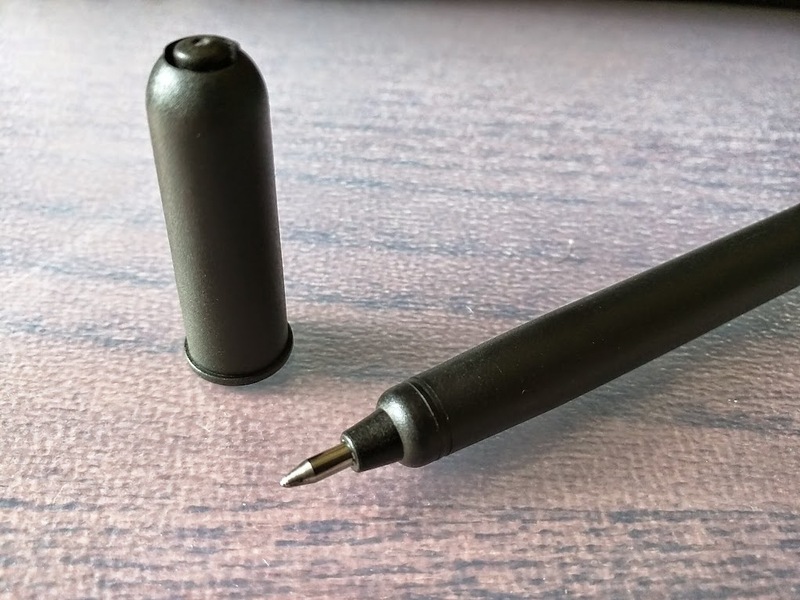 The end of the barrel, like the cap, includes a concentric circle design that is obviously a result of the manufacturing process, but nevertheless provides some visual interest to this gel pen. After use, this pen is going into the trash; unless you can find a creative use for the barrel. There is no way to refill the pen. 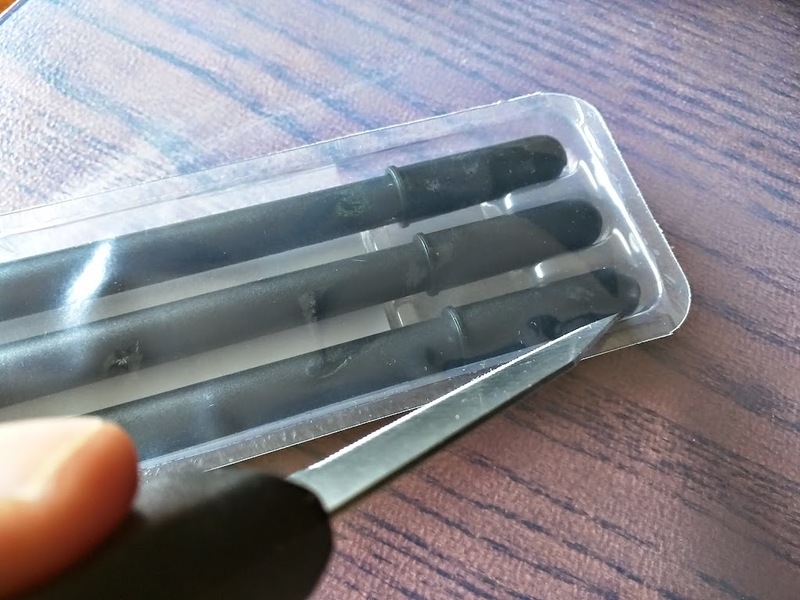 The ink tip and reserve is molded into the plastic barrel. After removing the cap, I was happy to find a white plastic ball on the tip. As shown in the image above, this ball protects the ink during shipment and ensures a fresh pen on first use. Removing this ball reveals a ball point tip. 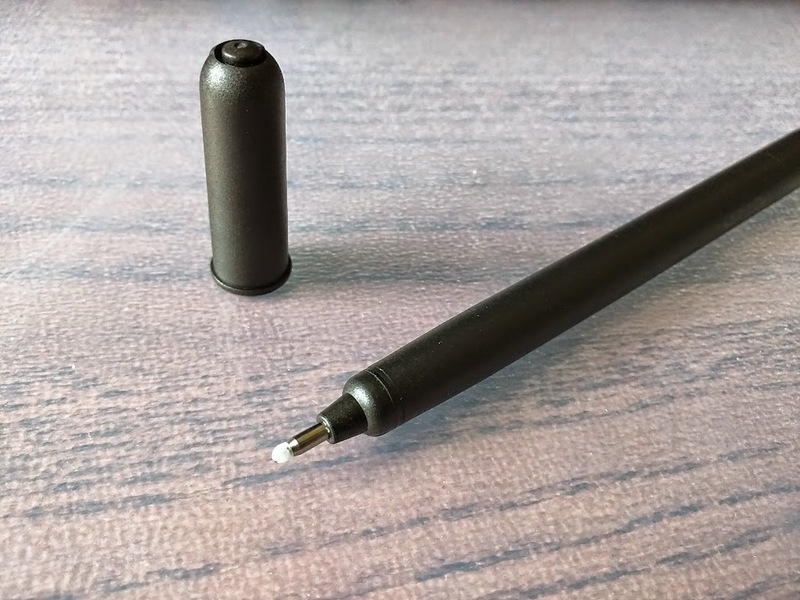 The FULLFÖLJA pen uses the ball point tip to guide ink on the paper. I am not normally a fan of ball point tips so was dubious about the pen’s writing experience. I took out my trusty Moleskine LEGO journal and began to craft a writing test. I chose to recreate some of the text and art found on the pen’s label. The pen itself was too light – scary light. I had problems holding the pen comfortably and after a bit of time drawing small intricate letters, my hand began to cramp. The matte finish did no favors for the pen. The pen slid around in my hand and I found it difficult to create details. The pen easily bends with a tight grip. I began to capture notes for this blog post. The more I used it, the more my hand cramped. Pilot HI-TEC-C maica pens were used to add a splash of color to the page and to give my hand a break from the FULLFÖLJA pen. I trudged through to create an entire page of notes. 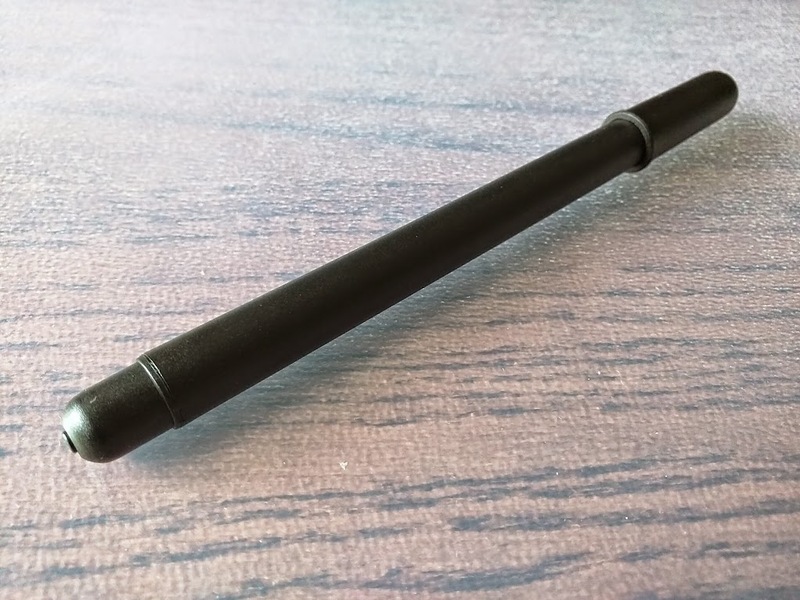 My blunt review of the pen’s writing experience – for lengthy writing, this pen is a disaster. Despite the horrible writing experience, here’s a surprise. This pen has amazing ink! I really like the ink in this pen. My guess is the thickness of the line is either a 0.5mm, 0.7mm or somewhere in between. Ink is dark and black on the page. Line thickness is consistent and there was rarely a break in the line. Despite my apprehension toward the ball point, the pen placed ink on the page with aplomb. Writing was smooth with nary a snag on the paper. It would seem that the Italian roots of this pen led to an excellent ink supplier. The pen ink is more consistent than the JinHao ink I shared in an earlier post. Bleed was on par with other inks I’ve used; which is to say, too much. Single line strokes will pool at start and end points if the tip is left in a single spot for more than a second or two. Go over a line more than once will always result in bleed as shown in the image above. Of course bleed will vary based on paper quality but you should expect it on normal stock. Bleed is a pet peeve of mine that I can’t let go. It probably isn’t as big an issue for most. My wife characterized the ink by saying, “It is wet.” This is spot on. The pen does leave a lot of ink compared to the Pilot pens we both use daily. Still, she summed up by saying she likes the pen for the short marks she makes while working through her to do list. 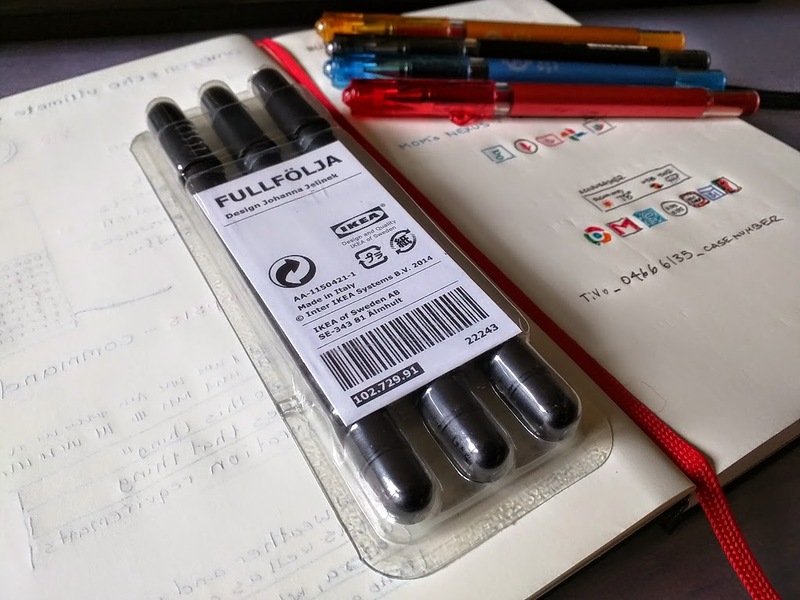 The IKEA FULLFÖLJA gel pen could be something special. The overall experience is harmed only by the barrel. If IKEA were to utilize a heavier barrel material and increase the circumference a tad, this could be a good pen. Maintain the price point and even pen snobs will stop by to purchase. Given the amount of wood IKEA utilizes, it would be interesting for IKEA to design a pen with a wood barrel. Pair it with the excellent stainless still tip and ink found in this pen and we would have a truly unique pen. As it is, we have a basic, throw away pen. Still, for the price, you should probably pick up a pack and give them a try. They will serve you well for signatures, gift tags, checkbooks or any other task that doesn’t require extensive writing. The pens are cheap enough to keep in those locations where you might not want to keep a more expensive pen. I plan to drop one in each car for on the go writing. 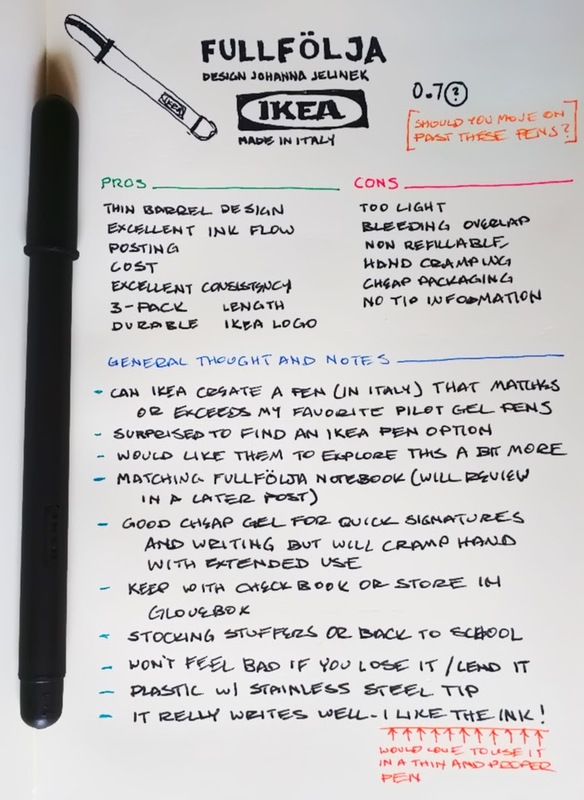 IKEA’s FULLFÖLJA gel pen is not a great pen and you can find better all-purpose pens almost anywhere; however, while shopping at IKEA, what’s another $2 for three pens. Pick up a pack and try them out. While shopping, check out their other FULLFÖLJA named stationary products. You will find uses for them and in true minimalist IKEA Swedish style, they look good, even if function is not always up to snuff. At least you will have one product in your bag you won’t have to put together when you get home.